Supposed author of the anonymous Hebrew-Italian school dictionary "Dabar Ṭob" (Venice, 1596, 1606), in three parallel columns in Hebrew, Italian, and German. The existence of the author and the book is, however, called in question. Steinschneider, Cat. Bodl. col. 855. Italian scholar of the nineteenth century; popular preacher and teacher at Modena. He wrote a number of didactic, religious, and casuistic works in Hebrew and Italian, including: (1) "Zeker Dawid," on customs of circumcision, two parts (Leghorn, n.d.); (2) Limmude Adonai," fundamental principles of religion for children, with Italian translation, three parts (Reggio, 1814, 1824); (3) responsa to the four Ṭurim; (4) commentary to the prayer-book and the Maḥzor according to the Italian ritual; (5) "Shelal Dawid," notes to the Pentateuch; and 300 sermons. Only the first three of these works have been printed. Mother of Abraham b. Daniel, who wrote over 1,000 liturgical prayers between 1536 and 1552, in which he celebrated her as a pious woman. These prayers are contained in the Codex Bislichis 72. 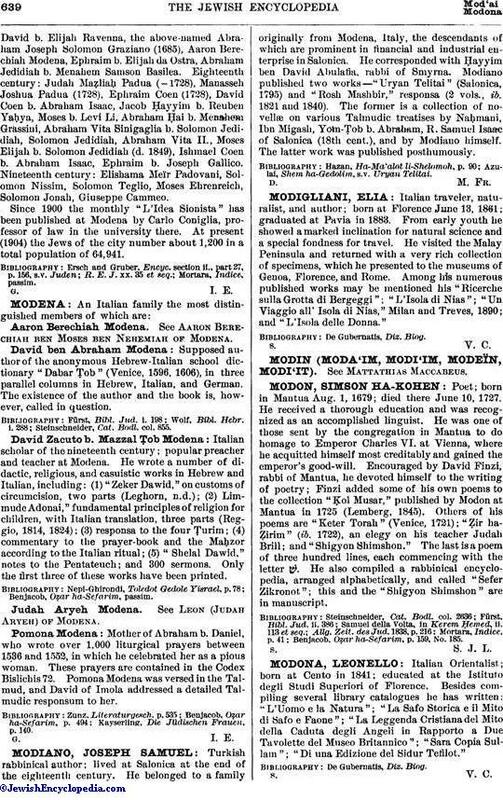 Pomona Modena was versed in the Talmud, and David of Imola addressed a detailed Talmudic responsum to her. Kayserling, Die Jüdischen Frauen, p. 140.